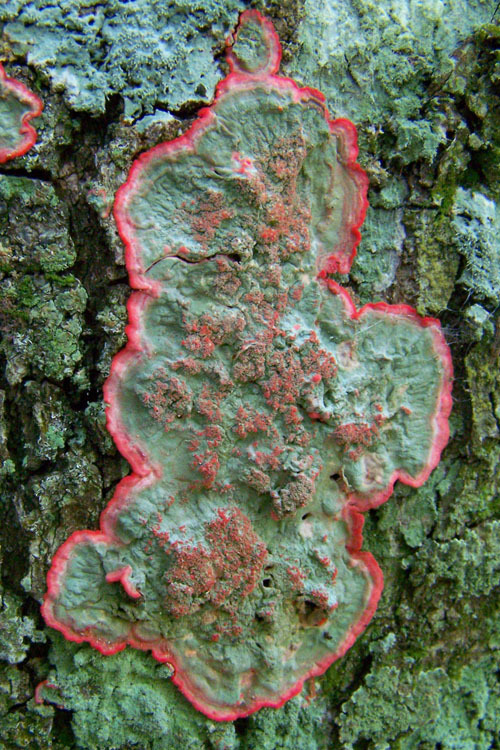 The Scarlet or Christmas Wreath Lichen, Cryptothecia rubrocincta – is a species of lichen common throughout subtropical and tropical regions in the southeastern United States, as well as Central and South America. It has even been found in a few places in Africa. The body of this lichen forms continuous, circular crust-like patches on tree bark and dead wood. It is easily recognizable by the prominent red pigment. The older, central region is covered with a red granular texture. Moving outwards from the center, zones of color may be distinguished, first is gray-green, then second white, and finally a bright red rim. The red and green colors of this unmistakable swamp lichen give the appearance of a Christmas wreath, suggestive of its common North American name, the Christmas wreath lichen. It is most often seen in swamps throughout the southeast on a wide variety of trees. Sometime the entire trunk of a Cypress tree may be colored by this scarlet lichen.